Girly Girl all the way! This navy with pink, blue, aqua, cranberry red, and brown flowery paisley romper is super soft with a row of pink ruffles and cranberry red and tan polka dot ruffles around the chest and three rhinestone buttons inbetween. The two rows of ruffles along the wrist, ankles of the romper, and tooshie match the ruffles on the chest. All of the ruffles have a navy trim There is snaps along the inside of the legs to easily change a diaper and two snaps at the shoulder to get over the head. 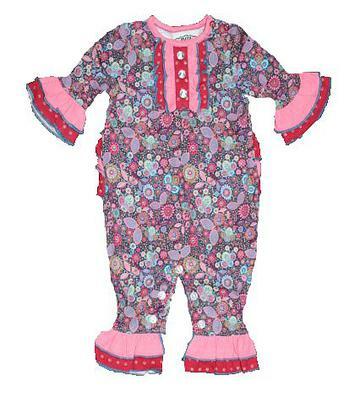 This soft romper is 100% cotton.